Dremel Drum Sander Band, 1/2 in Diameter, 1/8 in Arbor/Shank, Aluminum Oxide Abrasive, 60 Grit, Grade: Coarse, 30000 rpm, For Shaping and Smoothing Replaceable sanding bands covered with aluminum oxide abrasive used for rough shaping or smoothing of wood and fiberglass. Removes rust from metal surfaces and shapes rubber surfaces. Requires a mandrel with a 1/8" shank. Do not run in excess of 30,000 RPM. Polishing point is made to take a semi-rough finish and polish it to a smooth finish on most ferrous metals, stones, glass and ceramics. Used with 401 mandrel. Do not run in excess of 30,000 RPM. Makes fast clean cuts in drywall for electrical boxes, air vents and other wall features. Do not run in excess of 30,000 RPM. For rotary tool Nos.245, 250, Series 3 and later; Nos.260, 270, 280, Series 2 and later; Nos.275, 285, 370, 380, 395, 595; Free Wheeler 850; Mini Mite 750; Moto-Flex Tools 232 and 332; Chainsaver Tools 241, 246, 277 and 8504; Flexible Shaft attachments 225 and 90199; Handpiece 235 and 237. A high quality industrial abrasive made for extended general purpose grinding on metals, castings, welded joints, rivets and rust or for working with conical surfaces. Do not run in excess of 30,000 RPM. Industrial abrasive made for sharpening, deburring and general purpose grinding on harder materials including stone, glass, ceramic, porcelain, gemstones and non ferrous metals or for working with conical and flat surfaces. Do not run in excess of 30,000 RPM. For rotary tool Nos.245, 250, Series 3 and later; Nos.260, 270, 280, Series 2 and later; Nos.275, 285, 370, 380, 395, 595; Free Wheeler 850; Mini Mite 750; Moto-Flex Tools 232 and 332; Chainsaver Tools 241, 246, 277 and 8504; Flexible Shaft attachments 225 and 90199; Handpiece 235 and 237. 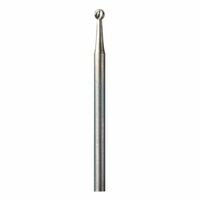 Rubber polishing points are impregnated with abrasive and used on on ferrous metals to remove rough areas, small burrs and scratch marks. Point is ideal for cleaning and defining grooves. Use for detail engraving, carving and routing in wood, fiberglass, ceramics, plastic, jewelry and soft metals. Do not run in excess of 30,000 RPM. A high quality industrial abrasive made for extended general purpose grinding on metals, castings, welded joints, rivets and rust. Specially designed for working with conic surfaces. Do not run in excess of 30,000 RPM. A high quality industrial abrasive made for extended general purpose grinding on metals, castings, welded joints, rivets and rust or for working with conical surfaces. Do not run in excess of 30,000 RPM. Sanding Band covered with 60 grit aluminum oxide abrasive. Use for rough shaping, smoothing wood or fiberglass, removing rust from metal surfaces and shaping rubber surfaces. Bands are easily replaceable on drums. Do not use in excess of 30,000 RPM. A cylinder covered with aluminum oxide abrasive that sits atop a mandrel with a 1/8" shank. For rough shaping and smoothing wood and fiberglass. Ideal for removing rust from metal surfaces. Also ideal for shaping rubber surfaces. 1/4" bit diameter (6.4 mm). Pack of 6. Polish silverware to high luster, car detailing and restore door and window hardware. Compatible with all Dremel rotary tools, EZ402 EZ Lock mandrel and standard 402 mandrel (619.9400). Do not run in excess of 30,000 RPM. For cleaning, light sanding and removing tarnish from brass. Use on metal, glass, wood, aluminum and plastics. For use with the EZ402 EZ lock mandrel (SKU #482.4447) or standard 402 mandrel (SKU #619.9400). Includes 2 fine 320 grit buffs. Cuts wood, plastic, fiberglass, drywall, laminate and aluminum and vinyl siding. Do not run in excess of 30,000 RPM. Easily cuts off slots bolts, screws, sheet metal, thin wood and plastic, trim castings and molded ceramics. Cuts only along its edge. Do not attempt to sand or cut curved holes. Do not run in excess of 30,000 RPM. Use with No. 402 mandrel. For No. 275, No. 285, and No. 395 Type 3, 4 and 5 Moto-Tools. Dremel Engraving Cutter, 3/32 in Diameter, 9-9/16 in Length, Ball Shape, 1/8 in Arbor/Shank, Carbon Steel, Silver, Applicable Materials: Wood, Fiberglass, Plastic and Soft Metals, 3/32 in Shank Diameter, Single Cut Tooth, For Engraving, Carving and Routing Ideal for cleaning and removing rust and corrosion from items made of brass, copper, gold or other soft ferrous metals. Perfect for getting into hard to reach places like slots. You can also use wire brushes to create an artistic effect on coarse-grained wood. Its shape makes it well suited for cleaning flat surfaces. Ideal for cleaning and removing rust and corrosion. Use on items made of brass, copper, gold or other soft ferrous metals such as tools, door knobs, automobile parts and electrical contacts. Can also use wire brushes to create an artistic effect on coarse-grained wood. Its shape makes it well suited for cleaning flat surfaces and getting into hard to reach places like slots. Used for sharpening chain saw blades, quickly and easily. Used for sharpening chain saw blades, quickly and easily.